"In a sense the [university] library has become the poster child for the impact of IT on higher education. Beyond the use of digital technology for organizing, cataloguing, and distributing library holdings, the increasing availability of digitally–created materials and the massive digitization of existing holdings is driving massive change in the library strategies of universities. 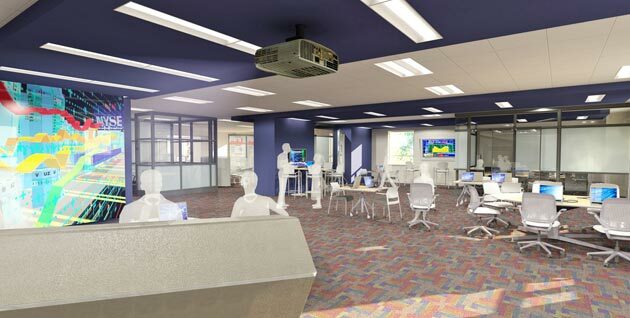 Although most universities continue to build libraries, many are no longer planning them as repositories (since books are increasingly placed in off–campus retrievable high–density storage facilities) but rather as a knowledge commons where users access digital knowledge on remote servers. The most common characteristic of these new libraries is a coffee shop. They are being designed as a community center where students come to study and learn together, but where books are largely absent. The library is becoming a people place, providing the tools to support learning and scholarship and the environment for social interaction." Duderstadt, J. J., W. A. Wulf, et al. (2005). "Envisioning a Transformed University." Issues in Science and Technology (Fall 2005).